9 inch ladies golf bag has a 14 way divided top. Comes with two oversize PUTTER/wedge tubes. Large cooler pocket and 5 easy access pockets. Two towel rings and Velcro glove attachments. Comes with a padded shoulder strap and rain hood. Has a removable accessory pouch for your makeup or wallet. This is the #1 ladies golf bag in the us market. The perfect organized golf bag for the lady with style. A performance stand bag that weighs only 4.7 pounds, the Hot Launch is a perfect combination of design and value. A 4-way padded double strap makes carrying easy, while a variety of pockets – including an insulated beverage holder and a waterproof velour-lined valuables pocket – makes keeping all your necessities handy. 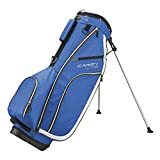 Glove it 8-way cart bag features full length dividers, zip off ball pocket with logo capability, seven easy access pockets, thermal-lined cooler pocket, easy life handle system, rain-hood cover, external putter tube, umbrella sleeve. This high-performance cart bag features a 15-way divider top with molded, easy-lift handles for convenient organization. Extra large garment pockets give you all the room you’ll need no matter what the course throws at you. A waterproof velour-lined valuables pocket keeps electronics safe while the insulated pocket keeps your beverages cold. Available in a variety of colors, the Hot Launch cart bag is the perfect value for any golfer. Sephlin Ladies GOLF BAG: ELEGANT STYLE Designed for The Elegant And Classy Lady Who Wants More Out Of Her Game. 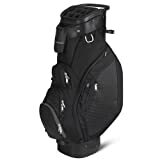 DESIGN 34″ Tall Stand Bag 9.5″ Neck With Built In Handle Removable Shoulder Straps Eight Pocket Dividers, Multiple Pockets. Towel Ring. Salmon/Purple/White BENEFITS Ultra Light Fabric and Design Allowing For Easy Use Feminine Style and Design in a Golf Bag Excellent Quality Cheerful style ADDITIONAL DETAILS Fabric: polyester and nylon Umbrella Holder Pencil and Tee Holder Removable Logo Pocket Imported. Up your game with Style and Fashion! The 5″ Sunday Bag by ProActive Sports is made of a lightweight, yet durable material. The perfect bag for hitting the Driving Range or Executive Course. This bag carries the clubs you need as well as having 1 Mesh and 2 Zippered Pockets for balls, tees, divot tools, or whatever else you may need during your round. If you’re traveling and space is limited, the 5″ Sunday Bag by ProActive Sports allows you to take your favorite clubs, without taking up a lot of space. Fits perfectly in the trunk of a car, a camper, trailer, or RV. When not in use, it can be folded up and stored neatly out of the way. Why carry a heavy full-size golf bag when all you need is the 5″ Sunday Bag by ProActive Sports? Made of a lightweight, yet durable material made to last round after round:This bag is the perfect alternative when heading to the Driving Range, Executive Course, or when a full size bag is just too much. Big enough to carry the clubs you need. Multiple pockets give you room to carry whatever you need to take with you without wasting space. Great for Traveling:This bag takes up very little space in a trailer, camper, or trunk of a car. When it’s not in use, you can fold it and store it neatly until you’re ready to go again. Perfect for Beginners, Juniors, or Senior Golfers who may not carry a full complement of clubs. Keep it in your car, to sneak away at lunch and hit the driving range. Features a padded shoulder strap for extra comfort and a convenient handle on the side to just pick it up and go. The sturdy construction of the Wilson Lite Carry ensures durability through various conditions. The Wilson Carry Lite has 5 closed pockets, including a valuables pocket, with lining inside to keep accessories dry and protected. This light weight cart bag offers premiums features and a sturdy construction to ensure durability in all conditions. The Wilson Cart Lite has seven closed pockets for ample storage with lining inside the valuables pocket to keep accessories dry and protected. The Diva, a women’s riding cart bag with a stylish edge, comes complete with all of the features that make Sun Mountain’s cart bags so functional. It has a reverse-orientation, 15-way top, an integrated handle to assist in loading the golf bag on a cart, a dedicated putter compartment and pockets that are all accessible when the bag is on a cart. Eight pockets including a velour-lined valuables pocket, beverage pocket, rangefinder pocket and a full-length apparel pocket. Pouch for keeping the strap out of the way when the bag is on the cart. 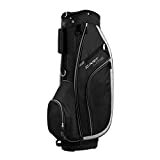 Find more Golf Bags For Women products on Amazon!